Cable Wrap | Spiral Wrap | Wire Wrap | Cal Fasteners, Inc.
Cal Fasteners carries forward-cut cable wrap to bundle and protect the routing of cables, harnesses, and hoses. An array of diameters are available, from 0.0625” to 7”, to meet your requirements. Available in natural polyethylene and UV-treated black polyethylene. Flexible polyethylene materials make installation quick and easy while providing secure bundling. Breakouts can be created at any point. Heavy duty wall thickness provides greater resistance to abrasions and vibration. ROHS compliant; UL recognized. 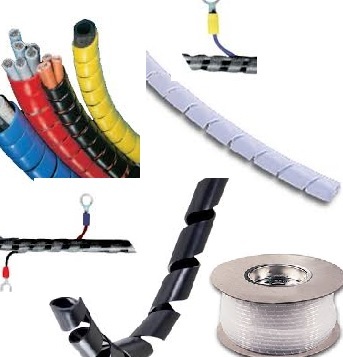 Request a quote on cable wrap for your project, or contact Cal Fasteners to learn more.